Accuracy inclusive of impedance mismatch for calorimetric method at most 4%, for detecting sensor at most 10%. Voltage range on-board power system 16…36V DC or AC with frequency range 48-1060Hz. Device mass at most 2,5 kg. М3-110, М3-111 are used for RF power measurement of signal generators and other source of SHF power with any waveform and any type of modulation such a CW, AM, FM, PM, pulsed on coaxial transmission line with impedance of 50 ohm and with 7.0/3.04 connectors. M3-112 are used for RF power measurement of signal generators and other source of SHF power of test oscillator with sine waveform. They can be used for calibration of power meters with smaller instrument rating, attenuation measurements of two-port transducers, measurement of emitting power with using of standard antennas. There are two frequently used principles of RF power measurement. One of them is diode detector based RF power meter and second is heat based RF power meter. The most straightforward form of RF power sensor used in RF power meters, employs diode rectifiers to produce an output. RF power sensors using diodes are designed so that the sensor dissipated the RF power in a load. A diode detector then rectifies the voltage signal appearing across the load, and this can then be used to determine the power level entering the load. The first is that they are able to measure signals down to very low levels of power. Some of these diode based RF power sensors are able to measure power levels as low as -70 dBm. This is much lower than is possible when using heat based RF power sensors. The other advantage of diode based RF power meter sensors, is the fact that they are able to respond more quickly than the heat based varieties. In some older power meters, the output from the diode RF power sensor will be processed in a simple way, but far more sophisticated processing of the readings can be made using digital signal processing techniques. In this way the readings can be processed to give the results in the required format, integrating over time is necessary, or having faster, more instantaneous readings if needed. M3-100 and M3-111 sensors are based on calorimetric method. RF power becomes to the load it turns to caloric power than this caloric power is measured and converted to display indications. M3-112 sensor is based on detection of RF signal. RF power becomes to the load than is detected and converted to display indications. 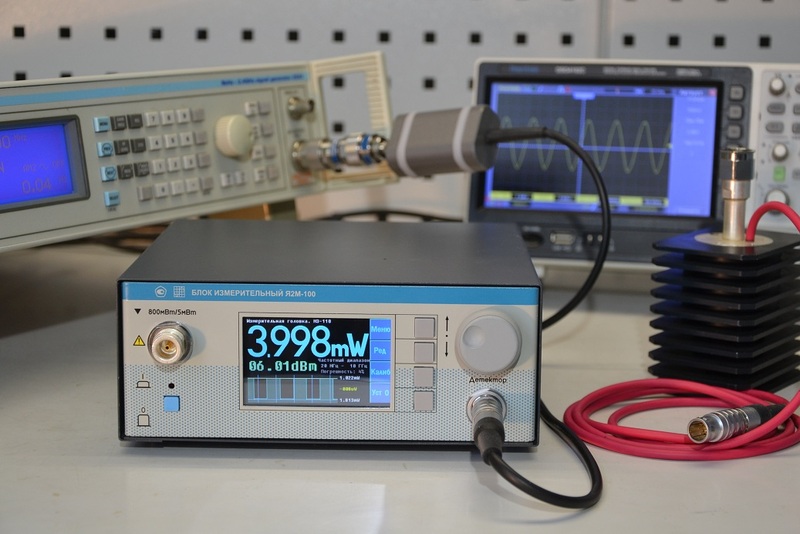 M3-112 can measure small signals from -54dBm, but displayed power is depend on waveform. Terminating power meter of versions М3-110, М3-111, М3-112 consists of metering unit where all data are processed and remote sensors which are converted RF power to primary signals. *In this moment, Device is undergone certification. It will be additional message about market launch.